The Revoltech line from Kaiyodo is one that generally hasn't interested me much. The range of figures boasted special 'revolver' joints that allowed accurate and realistic articulation, meaning you could pose them pretty much any way you wanted. However, this means that they are pretty much just action figures, and considering I'm going to display rather than play with them I've never been that hot on figures with visible joints. It's not helped either that the vast majority of the figures are based on robots and mecha, many of which are from older series I've not seen. If you want a poseable robot figure, you just buy a Gundam kit! Revoltech was an interesting idea, but it wasn't until this one that I saw much merit in it. Daioh!. When I saw this figure in Japan I had to buy it, it captured the innocence of the manga so perfectly, and considering the lack of any real Yotsuba&! merchandise it was something that jumped off the shelf at me. enough to hold a pose once you move them. They can be twisted and revolved on the legs and arms and the head tilts and turns as well, when coupled with the unobtrusive base and support the poses you can put it in are near endless. It must be said that the Revoltech figures are just action figures for grown ups, and the mecha ones - which include older series like Overman King Gainer and Tetsujin 28 - are made to appeal to adult collectors who had toys from the shows as a child. However, for my mind this Yotsuba Koiwai figure is the perfect application of the technology, creating something that is fun and enjoyable but good enough to be displayed as a figure. It's the kind of thing that you'll actually play with, make no bones about it, I've found myself re-posing the figure more often than strictly necessary and I've enjoyed doing it too. For me this is a technically excellent figure made even better by the choice of subject. 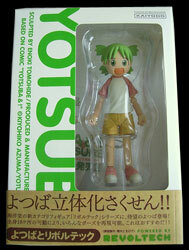 Everything about it just fits, and a stationary, non-moving figure wouldn't seem right for the energetic Yotsuba after it. This combination of function, form and subject makes the Revoltech 2G - Yotsuba Koiwai figure one of my personal favourites, and it's one that should definitely be bought! A decent selection of spare parts and accessories accompanies the figure, including an interchangeable head with an angry expression and spare hands. 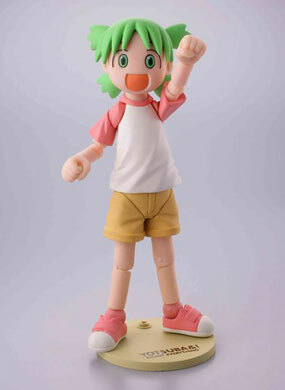 The figure also comes with an ice lolly and a water pistol for Yotsuba to hold, as well as a stand and support to hold Yotsuba in some more outlandish positions! There's also a random bit that appears to be a spare joint, maybe for the waist to allow yet more movement but I haven't checked this yet. Definitely not a bad selection of extras!